Look who’s visiting your house this December (and it isn’t Santa). It’s Transformers: Prime. This news came straight from Hasbro–Discovery Hub Official Twitter Account regarding Video-On-Demand. Stay Tuned With TFW2005’s Transformers: Prime Coverage, As We Bring You News… First. Is it me or is this December premiere a little too soon for a show that looks incredibly "un-finished"? I mean all we've seen of the show was that 30 second clip which was a "test clip" not even supposedly finished with, and then all the design sheets had some of the Autobots with unfinished rendering of the vehicle modes…for a show that is supposed to have a first season of 26 (? )/13 episodes it doesn't really look like they've finished anything, I rather they just wait until TF3 TDOTM finishes to premiere anything, I can keep myself at bay by watching Beast Wars and Generation one. December? Well, that's not too bad, I guess. It's better than it being released in 2011. Ah well, I look forward to getting torrents in December then. What I don't personally get. Is when you first started posting your posts were fine then out of nowhere suddenly loads of letter in words you knew how to spell previously were jumbled up as if you were rushing. The first quote makes no sense what so ever. Yet the second quote makes sense. It's like two different personalities, but that's just me. The title of this thread had me thinking they were making a TF holiday special like the old Star Wars special. Ahh,.. the good old days when Boba used a staff and had weird colors. Well at least I'm hoping they will air the first episode before Christmas Day. On Topic – I'm looking forward to the new show. English is probably not his first language, people. Lay off. I agree with Recall, I think you're just trolling now. I'm convinced you are now typing badly on purpose. I'm actually quite happy about that if it's true. This means we'll get more Generations toys. Okay, we have a date at long last. Hm… the first season of Prime should end just as the TF3 film rolls around. Conspiracy? 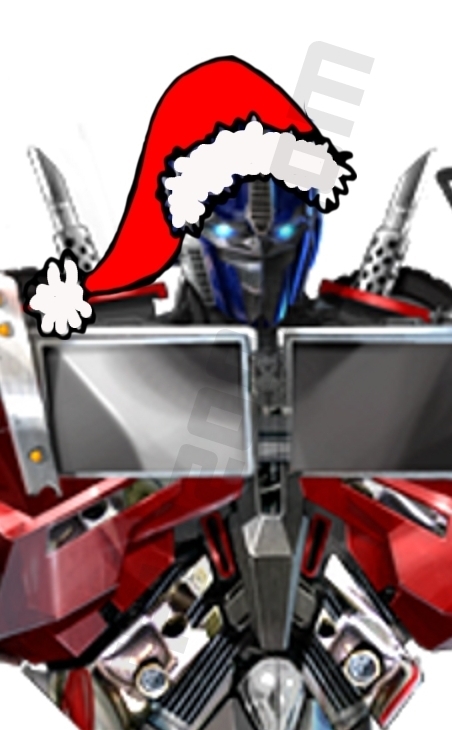 Don't know but Beast Wars and Cybertron DVDs can keep me warm till Christmas when Santa Prime rolls into town.